Things this semester are going to work a little differently than usual. See? I said a month and some ago that the 2.007 game is going to be either a riot, a shitshow, or a circus. It’s clearly very close to the latter, though I will not discount the possibility of rioting. Eli’s writeup on the game is in his post and the MIT internal class management site for the class is here. The table has some electronic scoring elements designed by yours truly. 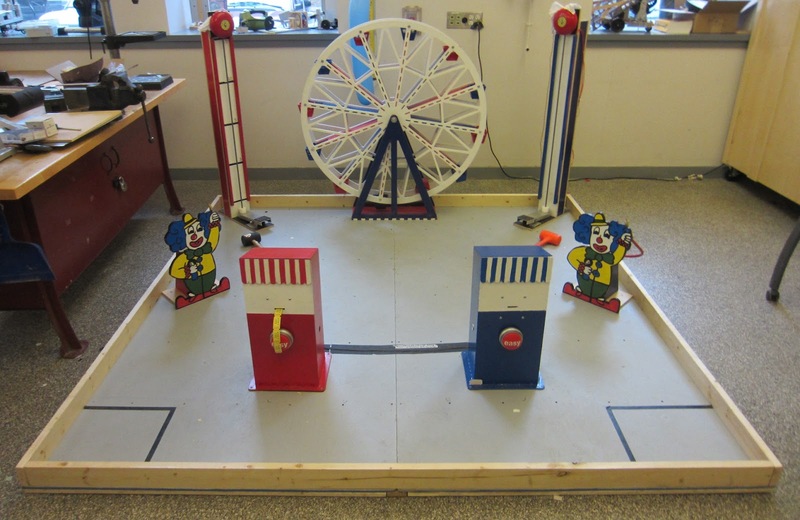 The high-striker game is electronically scored using IR breakbeam sensors, and a Deltronics DL-1275 arcade game ticket dispenser is behind the America-colored ticket booths (made of laser-cut MDF and plywood). The whole thing runs off a class-issue Arduino mothership. Don’t ask about the clowns – they were not in my jurisdiction. Yes! 2.00scooter is returning once again! This time under new management, namely me. 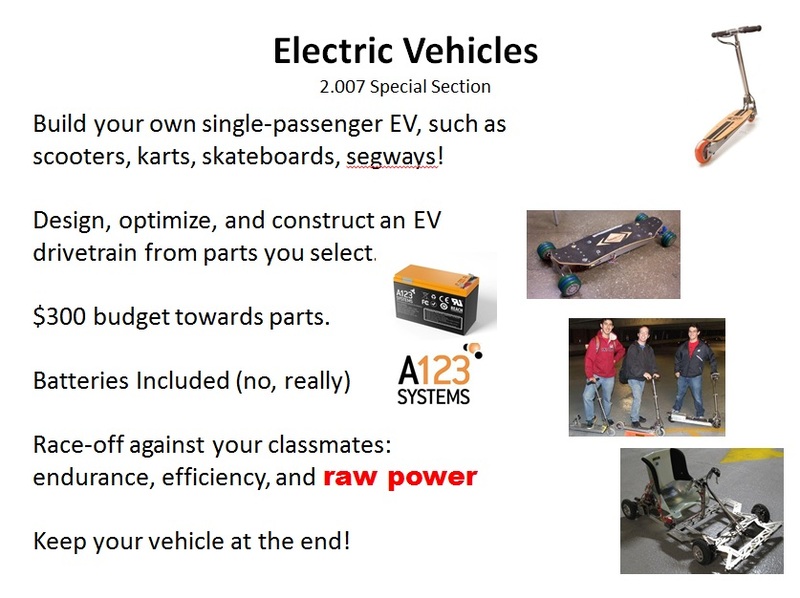 The lab section was not going to run this semester since its usual Electric Vehicle Team staff all have to either graduate or do thesis work in order to graduate. I decided to take over the operations since I wasn’t really satisfied with the organization from years past and what the students were actually producing by the end of the semester. There’s a little more Academic Rigor this year and more required design work instead of cut-and-fit. The section has 11 total people, so I’m hoping to see 11 (possibly 10 since there might be one group effort) more random vehicles trolling the campus by the end of term. This is one of the first uses of the newly renovated Building N52 space of the MIT International Design Center (I suppose if you asked me what research group or lab I am affiliated with, the answer would be IDC. That explains my random Singapore trips with the least amount of metasyntactic variables). It’s right upstairs from MITERS, so basically I’m going to do everything but literally live in N52 for the time being. Since the space is still new and barren, it looks kind of like a software company office. I’ve been taking steps towards making the space usable, and one of those is creating a minishop upstairs that will have most small fabrication capabilities. A full shop machine selection, including the auto garage and MITERS, is downstairs, but there’s no reason to have to go all the way down just to drill a hole. So a room is being populated with small garage tools, hand tools, etc. 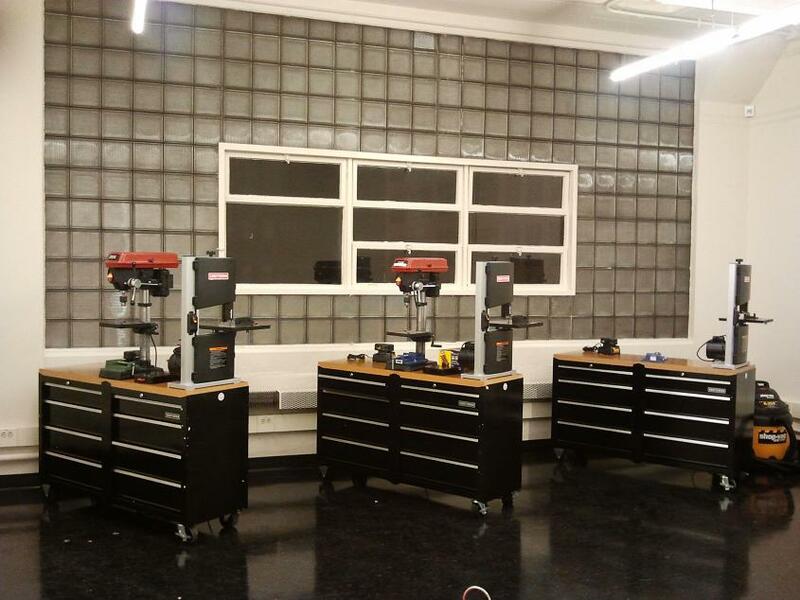 Soon to be in the same space will be a set of electronics tools such as soldering stations, hot air stations, oscilloscopes (nice oscilloscopes! ), etc. 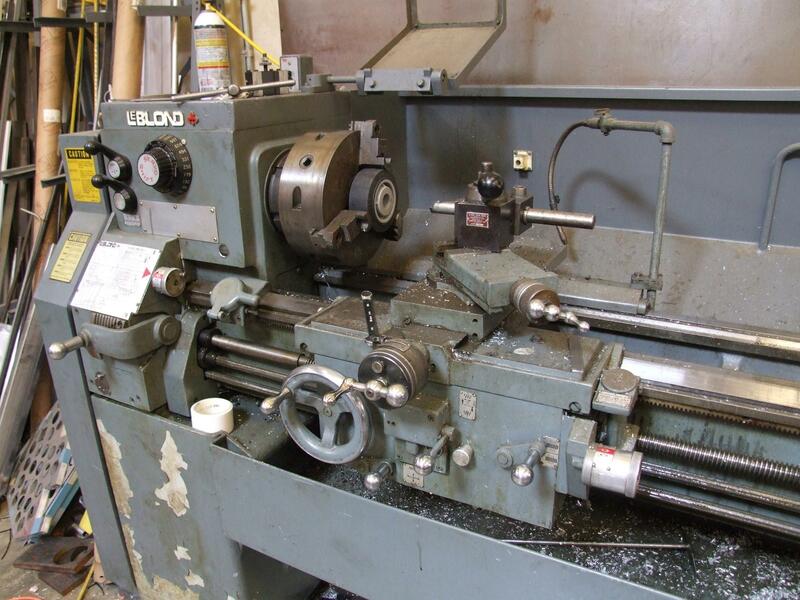 And most likely a mini mill and mini lathe, since you can make spacers, standoffs, and other small annoying custom hardware on those fairly easily without resorting to the 19″ LeBlond. All of these process threads means I might not be building anything particularly epic or involved this time around. But on the other hand, I’m also taking a class called Design for DIY Manufacturing. This could prove interesting. Part of the full-documentation project logging process is that everyone sees the painful and some times expensive vacillations between working and not working that a project goes through during its lifetime. This has happened with pretty much everything I’ve built and which is on this site. Usually it’s some kind of motor controller. But the most learning opportunities arise from the drift of a project about the boundary of dysfunctionality, so that’s why I still like this format over a finished and polished portfolio site. The first step of reconstruction was making the frame again – this was a relatively easy process since I still had square carbon fiber tube material remaining. 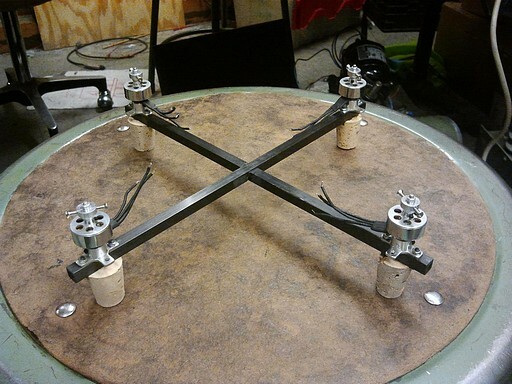 The center joint was once again CA glued together. This time, I also left a little more material beyond the motors so the tube didn’t tend to split when the mounting screws were tightened. While rummaging for hardware in a stockroom, I discovered a bin of glassware corks that I decided to turn into landing gear. I think this will work quite well – cork is pretty elastic but also very light, and not just squishy like something I’d find out of foam rubber in a similar size. 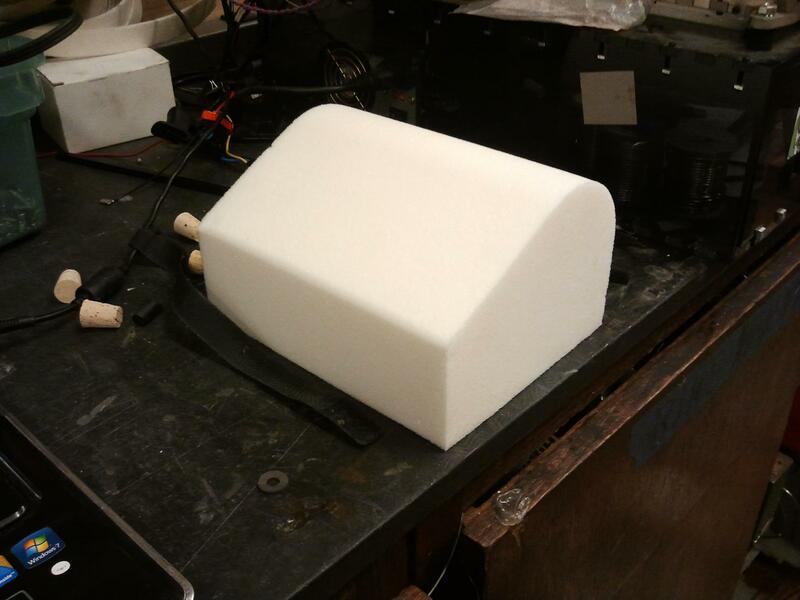 I obtained this big brick of memory foam from a disused mechanical engineering class (2.75) project. I’m going to just slap the entire electronics deck on top of a little brick of the stuff this time around. My experience with silicone tubing standoffs was less than satisfying since the tubing just tended to crack and shear with impact. Not trying to build Battlecopters here, but I’m definitely going to crash this thing infinity times, so a big surface of foam was still more advantageous. 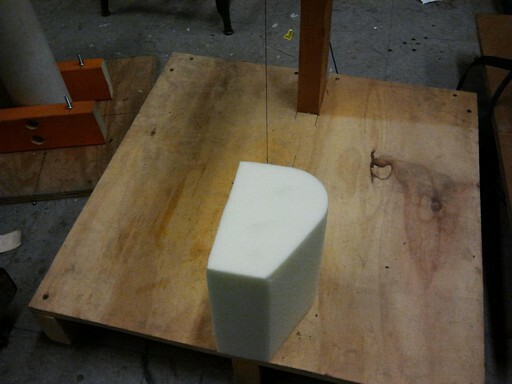 To extract a small 2″ square memory foam block from it, I finally got a chance to legitimately use my hot-wire cutter that I built last year when I thought I was manly enough to work with pink styrofoam to build Chuckranoplan (sorry Ryan, I’m still afraid of making foamy things). The side effect of this is that now I have an asston of filet de mousse à mémoire, so if anyone else at MITERS feels like building an n-copter, it is available. I bought a few 10A controllers from Hobbyking a few weeks ago in anticipation of eventually using them on a fresh build of Tinycopter. These things are pretty small and functional (having practically no settable parameters, not even throttle range calibration). 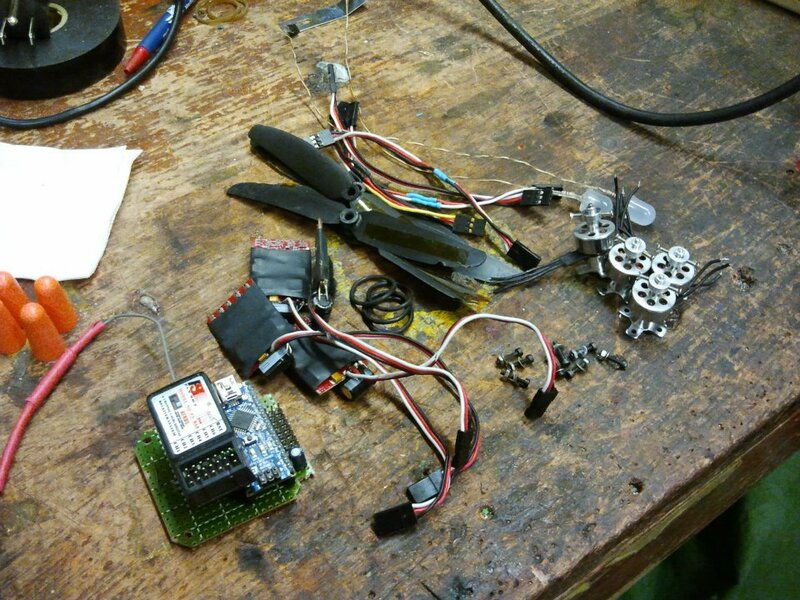 Having flown Tinycopter using them, I also can’t recommend them too highly because their throttle appears to be nonlinear. However, 6 dollars. One thing I didn’t like, and which would have interfered with my mounting plans, was the big electrolytic cap that hangs off them and makes neither side very flat. 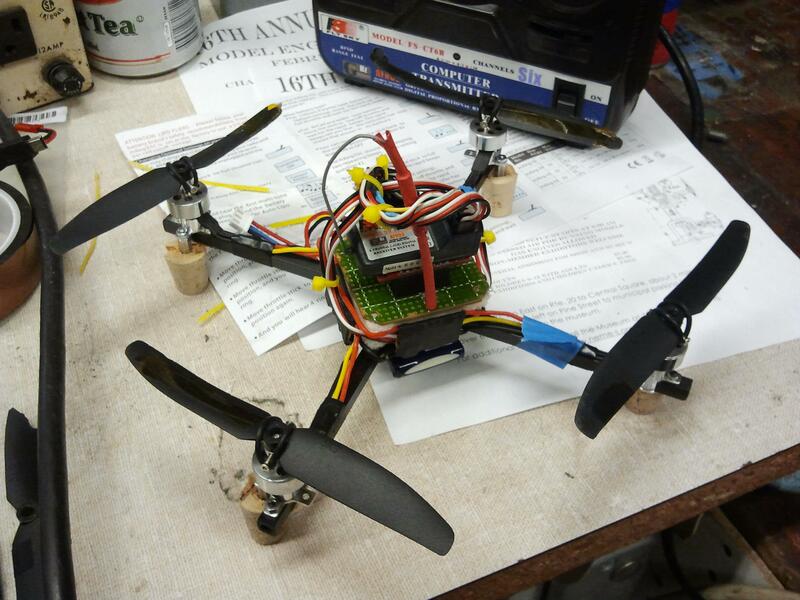 This was a small ESC, and I had 1206 package 16v, 22uF ceramic capacitors left from Tinytroller work (remember that?). The electrolytic was only 100uf, so I elected to replace it with 3 SMT capacitors, making the end result very flat and clean. Maybe I could have used more, but I didn’t think the ripple currents of such tiny motors was enough to warrant it – and what I lose in capacitance I probably gained back in lower ESR since ceramic caps tend to be inherently low resistance. So this is the plan. Superglue board to foam brick, then superglue foam brick to frame. 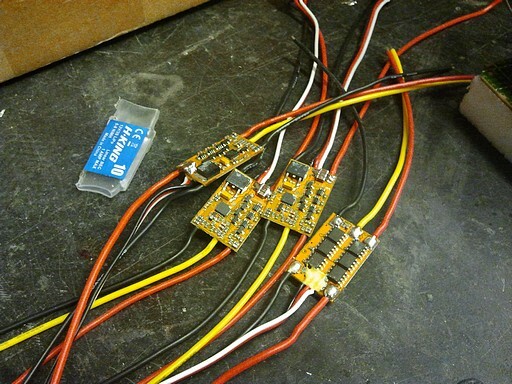 I repacked the ESCs in heat shrink tubing, then superglued them to the foam brick. Ryan, is this how you build foamy planes?!!? 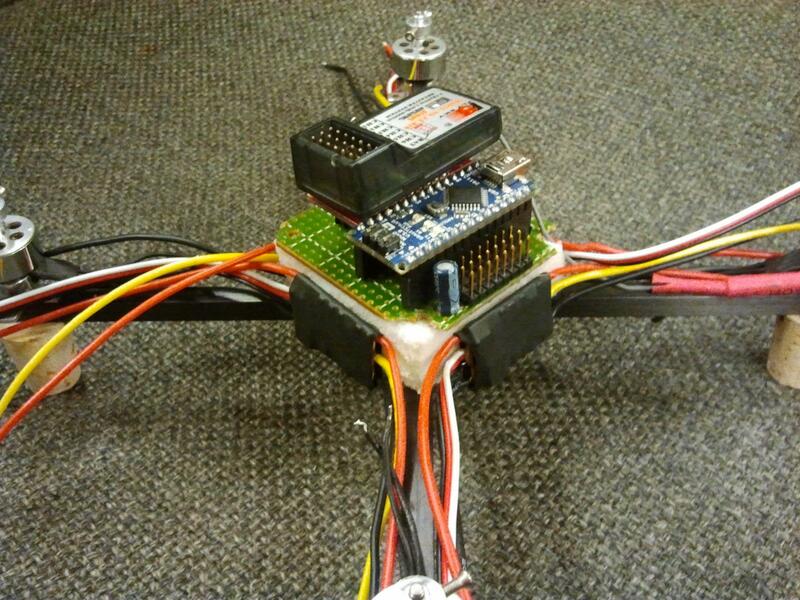 The tangentially located ESCs on this version allowed the wiring to be very clean and simple. It’s not nearly as big of a tangled ball as previous version, and the battery is now slung underneath the frame for easy access. Yeah yeah, pendulum effect, etc…. but on this scale, I have a feeling it doesn’t matter much at all. I ended up borrowing 2-56 standoffs from Shane again and impaled the corks upon them. The corks themselves weren’t structurally sound enough to just glue to the CF frame, so the standoffs provide a metal substrate which is directly mounted to the spare motor ears. 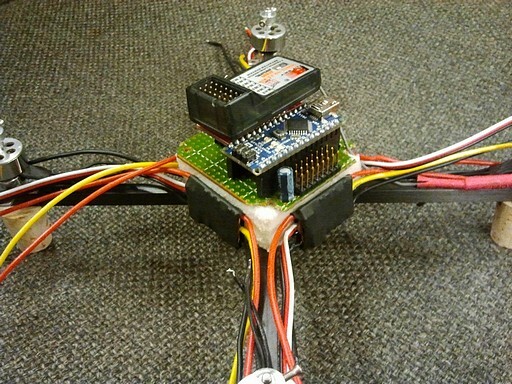 The Hobbyking 10A ESCs required alot of additional tuning of the controller before I got it to fly reliably. Their throttle seems to be quite nonlinear, and they are “punchier” at the beginning than the previous Turnigy Plush 18A controllers. This necessitated dropping the P and D gains down to 1.2 and 0.2 respectively, from their former values of 2.2 and 0.6! The difference between ‘slowly sinking’ and ‘slowly rising’ altitude is pretty much two left-stick ratchet clicks, which means it’s much harder to hold altitude. 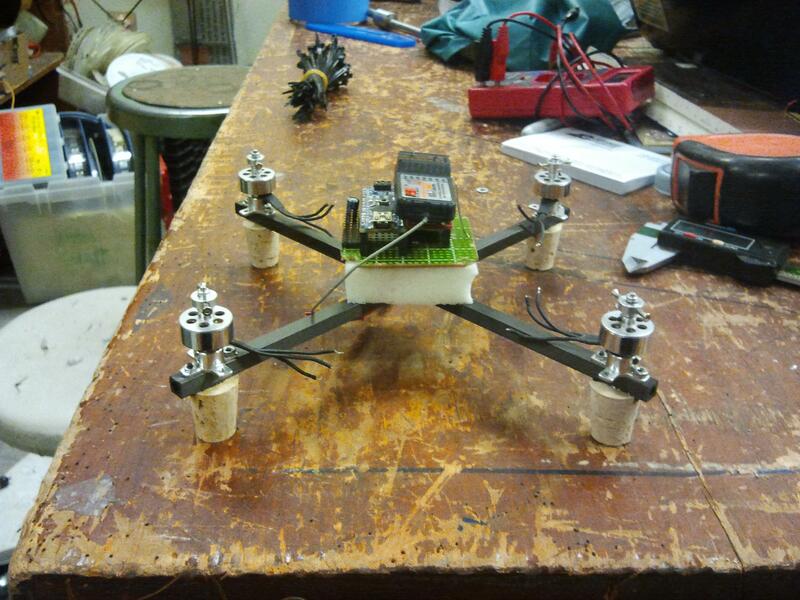 All said, after some more loop tuning and poking, Tinycopter flies once more. By now, most of you probably have seen this. I think it’s fairly common in engineering to give beat-up prototypes and vehicles a warrior’s sendoff by making it do things you would never do with a new one. Tinycopter was pretty much a wreck already going into this “test”. The carbon fiber booms were splitting, the props were again cracked and taped together, and the four silicone tubing standoffs had mostly sheared through, causing the whole board to become very wobbly. It was almost impossible to control, a fact visible by the constant pendulum-ing seen in the video. Since I was going to have to rebuild it from scratch anyway, and everyone around me was building tesla coils, the choice of final voyage was clear. Except it survived fine. The damage in fact was all mechanical – it flew fine after the first strike, and was just too broken to do so successfully afterwards. 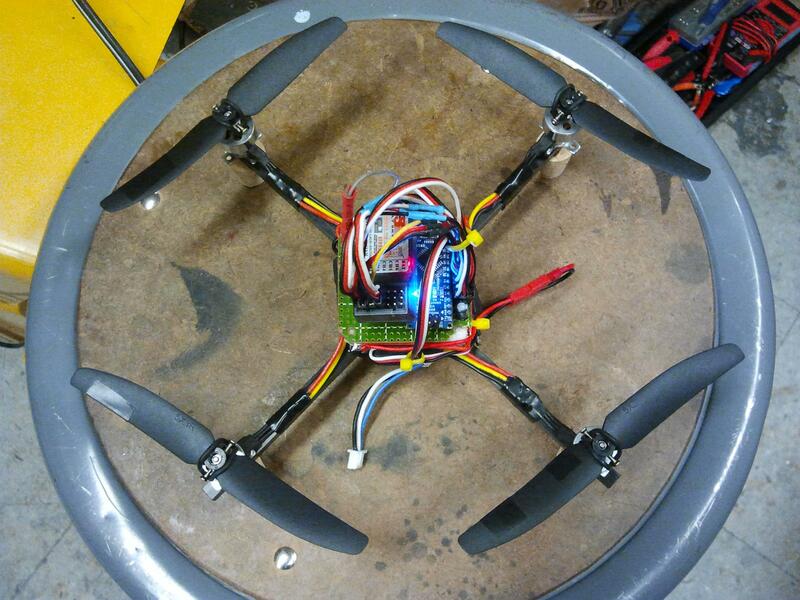 Avoiding the Ship of Theseus problem, Tinycopter’s control board will be retained and used for the frame rebuild. Theme created by miloIIIIVII | WordPress | Entries (RSS) | Comments (RSS) | 28 queries. 1.004 seconds.